Samsung Pay and mobile payment services of its ilk are only as good as the credit and debit cards they support. If you can't insert your bank or credit union into the app, you're still left swiping every time you get ready to spend money. Today Samsung has announced eight additional partners. Samsung Pay is compatible with American Express, MasterCard, and Visa. Thanks to MST support, Samsung Pay works at most terminals that accept any of these cards. Folks with an eligible Samsung device who have yet to try Samsung Pay can get $100 to spend at Samsung.com if they activate by November 30th. The coupon code can then be redeemed between December 15th and the 31st. Head to Samsung's website to sign up. NEW YORK--(BUSINESS WIRE)--Samsung Electronics Co., Ltd. announced today that Samsung Pay, the most accepted mobile payment system, now supports eligible Chase Visa® credit, debit and Liquid® cards, as well as debit and credit offerings from MasterCard issuers: Citizens Equity First Credit Union, Randolph-Brooks Federal Credit Union, Security Service Federal Credit Union, State Employees’ Credit Union, SunTrust and Virginia Credit Union. 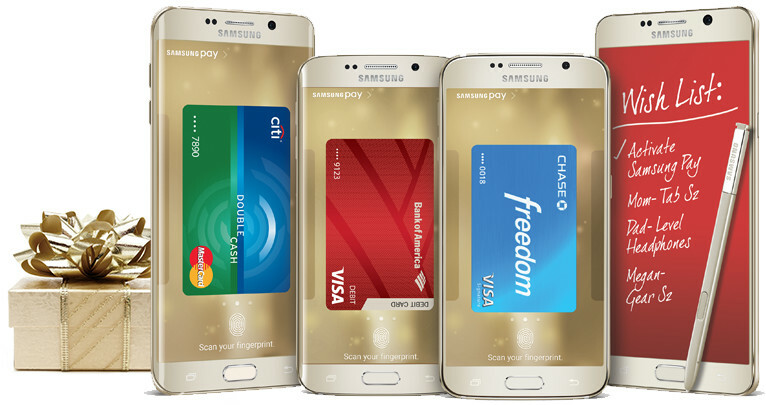 Samsung Pay also now supports Navy Federal Credit Union Visa® credit and debit cards. Cardholders of all these issuers will be able to use Samsung Pay to pay almost anywhere they can swipe or tap their card.